Uranium Overdose: ARCHAGATHUS / NO THOUGHT - split 7" out now! ARCHAGATHUS / NO THOUGHT - split 7" out now! Uranium Overdose proudly announces their new Archagathus / No Thought 7" as out now! 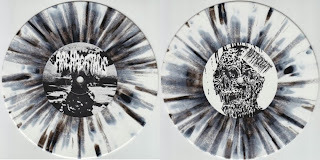 Canadian grind punks Archagathus present two longer tracks with inhuman vocals and ultra heavy sound that were recorded in Summer 2012 with the line up from their USA and Canada tours (Dan + Violent Gorge). They are 100% previously unreleased and exclusive to this 7". No Thought on the flipside hail from Denver, CO and play excellent old school grindcore. The four tracks featured on their side of the 7" are without a doubt their best material ever recorded. Razor-sharp sound, catchy rhythm changes and sick vocals! Fully recommended for fans of Catheter, Roskopp, Insect Warfare and the like. This nice split 7" is released in a limited edition of 525 hand-numbered copies in deluxe white / black splatter vinyl perfectly matching the cover art. Combined shipping makes the shipping prices very cheap worldwide. Get in touch!